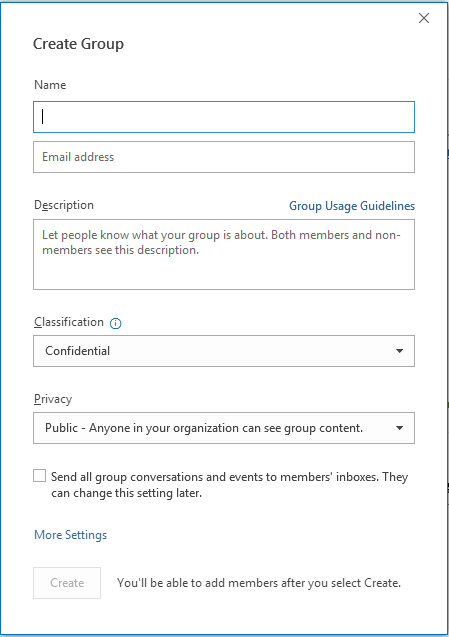 A Office 365 group is different from a contact group (formerly called a distribution list). A contact group is a set of email addresses that you can use to send an email message or meeting invitation to everyone at once. 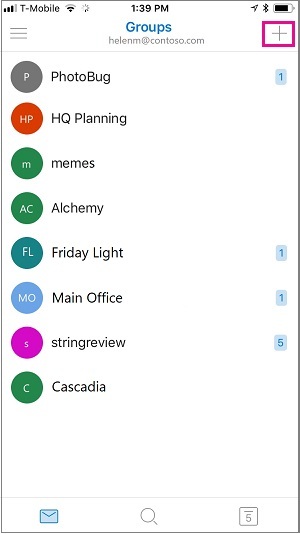 To create a contact group, see Create a contact group. Select Home > New Group. Don't see New Group in your ribbon? Your IT department might not have enabled Groups for your organization. Contact them for assistance. Fill out the group information. Group name: Create a name that captures the spirit of the group. Once you enter a name, a suggested email address is provided. "Not available" means the group name is already in use and you should try a different name. Note that once you choose a group name, it cannot be changed. Description: Optionally, enter a description that will help others understand the group's purpose. This description will be included in the welcome email when others join the group. Classification: Choose a classification. Options available depend on what your organization has set up. Privacy: By default, Groups are created as Private. This means only approved members in your organization can see what's inside the group. Anyone else in your organization who is not approved cannot see what's in the group. Select Public to create a group where anyone within your organization can view its content and become a member. Select Private to create a group where membership requires approval and only members can view group content. 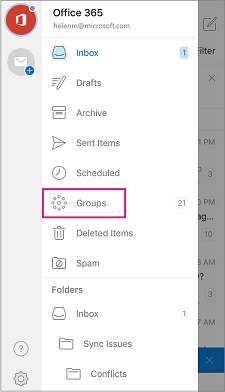 Send all group conversations and events to members' inboxes Optionally, check this box to enable members to see all group conversations and events in their inbox without having to visit separate group workspaces. Members can change this setting for their own mailboxes. Select File > New > Group. Don't see Group in your menu? Your IT department might not have enabled Groups for your organization. Contact them for assistance. Description: Optionally, enter a description that will help others understand the group's purpose. This description will be included in the welcome email when others join the group. Click Next. Type member email addresses or select members from the contact list to add to the group. You can add guests who are people outside your school or your organization to the group. Click Create. You'll see a welcome mail in your newly created group inbox. 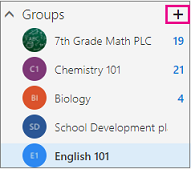 In the navigation pane, under Groups, select New Group or right-click on the Groups node and select New Group. Don't see Groups in your navigation pane? Your IT department may not have turned on Groups for your organization. Contact them for assistance. Don't see Groups in your navigation pane? Your IT department might not have enabled Groups for your organization. Contact them for assistance. Don't see Groups in your folder pane? Your IT department might not have enabled Groups for your organization. Contact them for assistance. In the Groups header, tap +. On the New Group page, type a name for the group > Next. 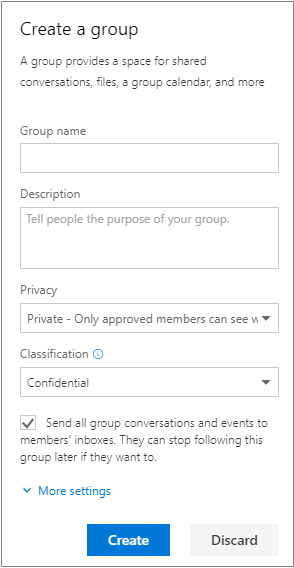 On the Settings page, enter the required information, including privacy level, (Public or Private), classification, and whether group members should follow group conversations and events in their personal inboxes. Type member email addresses or select members from the contact list to add to the group. You can add guests to the group. Tap Add. You'll see a welcome mail in your newly created group inbox. A Professional Learning Community (PLC) group is a type of Office 365 Group that provides a shared space for educators to use for collaboration. PLCs are available in the Office 365 Education plans. A PLC is very similar to other Office 365 groups. It comes with a shared mailbox and calendar, shared document library, and OneNote Notebook. The notebook is designed for educators and includes templates and lots of resources that provide ideas and assistance. Your IT department can turn the ability to create groups on or off for your organization. If, after following these instructions, you aren't able to create a group, contact your IT department. On the Professional Learning Community tile, click Next. In Group Name, enter a name that briefly captures the spirit of the group. A suggested email address is provided. If you see "not available," the group name is already in use. Try something different. Note that once you choose a group ID, it cannot be changed. In Description, enter a detailed description of the group to help others understand its purpose. This description will be included in the welcome email when others join the group. To create a group in which membership requires approval by a group owner and only members can view group content, select Private. To create a group in which anyone within your school or organization can view its content and become a member, select Public. Optionally, select Send all group conversations and events to members' inboxes. This is recommended when members belong to multiple groups because they can see all group conversations and events in their inbox without having to visit the group workspace. This setting will apply to anyone who you add to the group now, or who joins the group later. After joining the group, each member can change this setting. If you're ready to add members to your newly created group, continue with the create group wizard. Otherwise, select Not now. You can always come back and add members later. 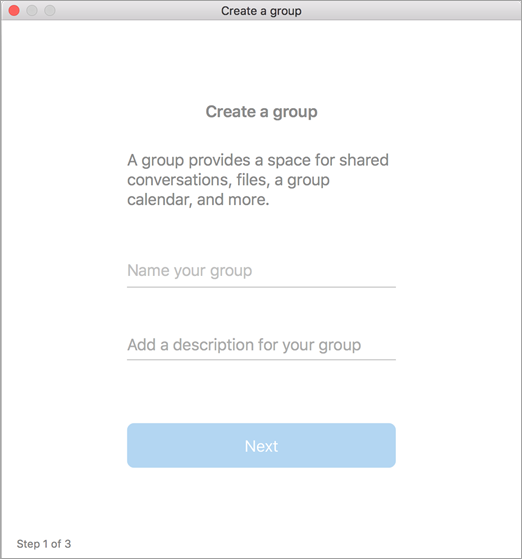 You'll see your newly created group in the left nav and a Welcome email in your group's inbox.